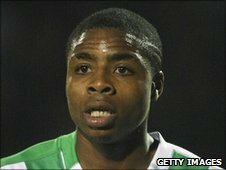 Yeovil Town have signed Tottenham Hotspur striker Jonathan Obika on loan until the end of the season. The 20-year-old was recalled by Spurs from Swindon on Wednesday because of a lack of opportunities with the Robins. But the Glovers have wasted no time in signing him up with manager Terry Skiverton telling BBC Somerset: "He'll come in and be involved straight away." Obika, who has played twice for Spurs, has had two previous spells with the Glovers, scoring 11 goals in 35 games. He has also had stints with Crystal Palace and Peterborough this season. Skiverton added: "He'll be massive for us. He came in this time two seasons ago and made a big impact. He's got goals in him."